Coming up with the squirrel costume idea: Breakfast time at the Dempsey house usually consists of three things for our son Garrison; yogurt, cheerios and watching the squirrels frolic and play. Garrison’s high chair sits adjacent to a large window in our kitchen and he is able to see directly into the yard and nearby forest. Ever since we started feeding him in his high chair, he has had a fascination with watching the little gray squirrels run and climb the trees. He has also learned how to pretend to “eat” like a squirrel as he will bring a cheerio to his mouth with both hands and nibble it like a squirrel would munch on a nut. 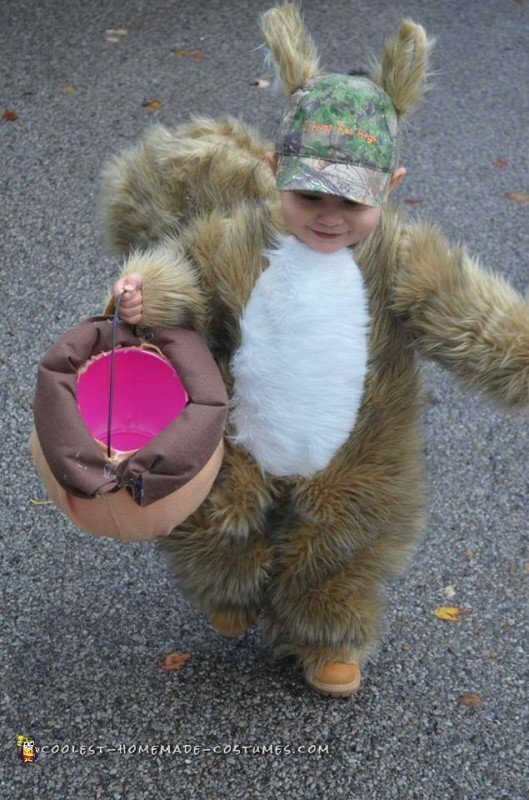 This in particular got us thinking that Garrison had to be a squirrel for Halloween! This idea was much easier said than done however. 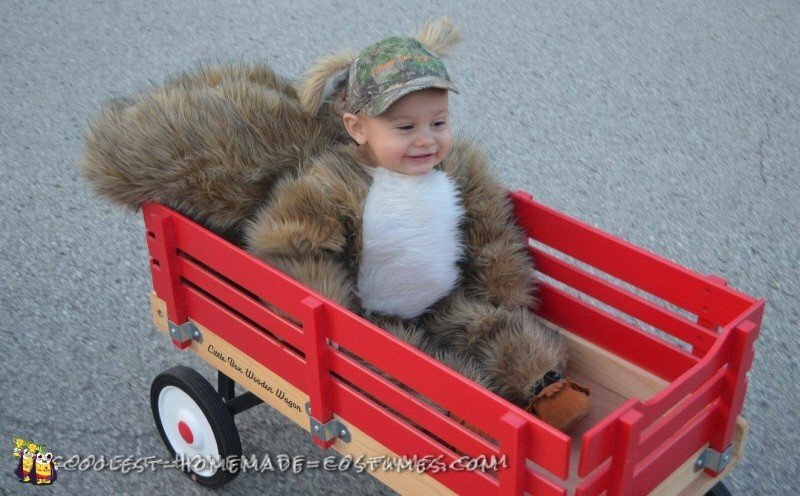 The wheels started turning and ideas started flying as to how we would go about making this squirrel costume. As a prelude to the costume making story, I must admit that I had almost zero experience with a sewing machine and had never even taken mine out of the box. However, I was bound and determined to somehow teach myself the basics in order to create a squirrel costume. Find the correct material. Well..we were already hitting a roadblock. I had an exact type of material in mind, but the department stores were not taking kindly to my planning. My husband and I traveled to two different Joanne Fabrics, one Michael’s and another Wal-mart. Absolutely nothing! As we walked out of the final store it was as if our hopes for this Halloween were shattered. There was only 2 days left until the first costume opportunity, a trunk or treat in Ligonier, PA, and having a squirrel costume by then seemed inconceivable. Sure we had other costume ideas, but none as impressive as the squirrel. We decided to try one more time at a Wal-mart a little further from our hometown. We walked back to the fabric section and lo and behold, sitting in all its glory, was the exact material that I had been envisioning! My husband and I looked at each other and at this same time, with little bit of crazy in our voices, said “lets do this”! We were already getting weird looks from others in the fabric line and some even asked what we were planning on making. People gave a little chuckle when we told them our plan was to make a squirrel. We laid the fabric down on the table and immediately felt bad for the poor man that had to cut it. Hair was flying everywhere. He actually had to back away a few times because it was getting in his mouth. At that time, we knew we were in for quite the little mess at home. All this being said, we waltzed out of the store as confident as ever to start and complete this squirrel costume in 2 days. Pattern? Well we needed something to base our squirrel costume off of. We had an idea of how we wanted to make the tail but the body we were not so sure about. Remember, I nor my husband, have any experience sewing anything. So we went to another fabric store and found a pattern for a bear or panda or something. We thought we could kind of base the body off of this. Well we got home and the creative juices continued to flow. Now what? As I mentioned, we could not just stop for the night after finding our beloved material. We put Garrison to bed and began to tackle what we thought was the impossible. First line of duty, make heads or tails of the pattern. We thought this would be the easy part. We laid out those pieces of tissue paper and thought we were reading a different language, turns out we were. Sewing lingo is definitely a real thing and we had no idea what the majority of the lines meant. We cut out what we thought we needed and then got right to the material. I put my husband in charge of pinning the pattern to the material. As I cut the pieces of material, pieces of fabric hair were shedding everywhere and we were beginning to wonder how we would ever be able to sew through it. Well we managed to cut out all the pieces but what we were looking at did not resemble any sort of animal. Quite unsure of how we would ever put these pieces together to look like a squirrel we moved on to the next step. So you think you can sew? After removing the sewing machine from the box, we eventually figured out how to set it up. After a few hiccups here and there, I was well on my way to creating this squirrel costume. My husband decided to go to bed, mind you it is about midnight at this time. I continued working until the wee hours of the morning. When he woke up the next day, he was completely astonished at what he had seen! It actually looked like a squirrel! The only thing missing was the tail. Once he came home from work, we began planning the tail. We figured this had to be the focal point of the costume. It had to be slightly over-sized but could not weigh down poor Garrison as he walked around. The design and sewing of the tail actually went very smoothly. Applying it to Garrison and the body suit was a different story however. We eventually settled on belts and lots and lots of safety pins! The finishing touch was creating an acorn out of one of those trick or treat pumpkins. At last, we could put the costume on him and see our little squirrel in action. He hated it!! I mean really hated it. Well we are done we thought. No way will he ever walk around outside with it on. We decided we had to go forth with the costume because well, it had to work. Trunk or treat in Ligonier, PA was the next evening. We loaded up the car and drove with very little expectations. We put the squirrel on him, took him inside (because it was unfortunately raining) and it was as if he was the star of the show. He was a completely different child than at home. To say that he stole the show is an understatement. The bright lights came on and he just began to perform. He was running from table to table, smiling and laughing with everyone. He loved it! People continually asked to take his picture and saying things like “this is the best costume ever!” Nobody could believe that we had actually made it. We left the trunk or treat extremely proud and excited about the rest of the Halloween season. The Pittsburgh Zoo was holding their annual “ZooBoo” that weekend. During this you can walk around the zoo and different exhibits will have candy and treats. They also have a costume contest that we thought we would enter. Our expectations were slightly higher this time considering how well Garrison did at the last event. As soon as we walked through the zoo gate, the reactions began. I cannot tell you how many people took his picture and asked where we got such as awesome costume. Everyone was astonished that we made it ourselves. It was funny to hear off in the distance “Oh my look at the squirrel” and other people talking about it saying “yes and his mother made it”. Well, to make a long story short, our little squirrel came up a bit short that day. Third place is nothing to scoff at, but we may or may not have been slightly salty. 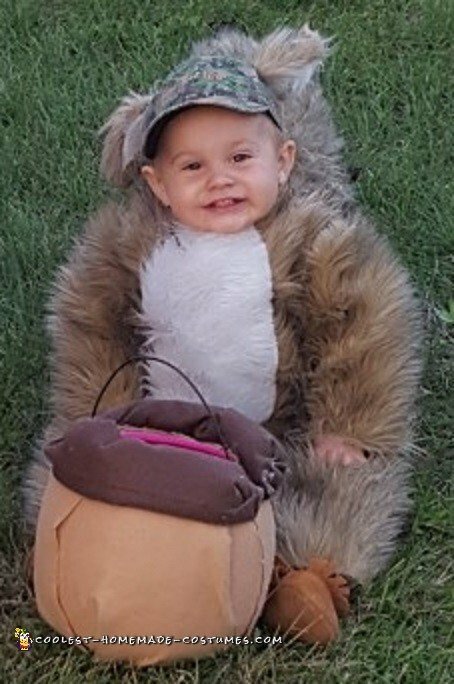 I mean, the first and second place costumes were pretty good, but a 16 month old running around in a squirrel costume is pretty darn cute, however biased that sounds. Nevertheless we were very excited for the opportunity and even more excited at the great reactions we got out of most the people we came into contact with. Our next stop was the Latrobe, PA costume contest and Halloween parade. We arrived a little early in order to get our little squirrel prepared. There were not too many people there originally and we thought our chances were pretty good. Well, only a few moments later, crowds of Halloween costumes began to flood in. It seemed like several hundred were there and ready to have their costume judged. We knew it would be almost impossible for him to win. There were some very excellent costumes and you can tell people are very creative. Again, as all the other places we have been, people flocked around Garrison’s costume. At this point, he was really learning how to get into character. He was wildly running from person to person and then into the nearby trees. We couldn’t keep our hands on him. It was as if he was imitating the squirrels he watches every morning. It came time for announcement of the winners. “First place for most original goes to…Squirrel Boy!” We were very surprised and excited. Out of all the great costumes, Garrison had won. He ran right up to the firetruck and claimed his prize. Seems like he knew he had done something right and was proud of it. He stood there and clapped for all the other winners, which drew even more attention to him. The parade followed shortly after and in true Garrison form, he strutted his stuff all throughout the parade route. People snapped pictures and pointed and laughed. Photographers snapped his picture and asked our information and how we came up with such a neat idea. A few days later, Garrison was on the front page of the Latrobe Bulletin, our local newspaper! It was a proud moment to say the least. I have to say that this halloween was a complete success. We actually managed to create the costume that we had envisioned. The reactions and compliments we received were absolutely priceless. However, all of this could not have been done without the spirit and character of our little boy Garrison. He absolutely loved showing off his costume. He really did turn into a different child while he was in character. We watched as he ran wildly from place to place and it was almost like a game trying to make us catch him. Next year we have some big shoes to fill!